The Funky Felter: What's your blog worth? Oh, only if those big bucks were truly real! What's your blog worth? Oh, only if those big bucks were truly real! Have you ever wondered what your blog's worth? Well, maybe not. If you blog mainly for fun like I do, then perhaps it never crossed your mind. It really never crossed my mind either, but I found this nifty little calculator created by Business-Opportunities.biz and powered by Technorati which (through its online magic) gives you a dollar figure amount for your blog. I'm not sure how accurate it is, and honestly I don't think that dollar amount really amounts to anything in the real world, but it is certainly a fun little distraction for a few minutes. 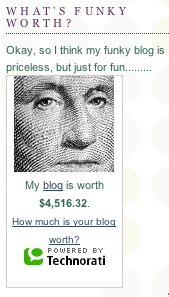 Oh, and it is also fun to check and see what other blogs are worth. Just click here to go find out the worth of your blog or someone else's. You can also get a little button to display your own blog's worth if you dare make it public! I thought this would be fun, but when I tried it, it said my blog is worth a big whopping $0. Guess I won't be posting it on my blog as it may scare readers off (and I do have a few of those).